Mark Clementz didn’t actually seek out celebrity status, but he doesn’t seem to mind it either. No one, after all, forced him to run a YouTube channel dedicated to growing giant produce. There, he often appears as his alter-ego, Bubba Presley, sporting aviator glasses, jumbo-sized fake teeth, and a coiffed black wig. But he could do without the pumpkin paparazzi: One time, someone trespassed onto his property to get a peek at a champion pumpkin. The perpetrator stepped on the vine, halting the growth of what Clementz says could have been one of his biggest yet at a mere 1,700 pounds. Green thumb: Mark Clementz (right) brought in $10,000 in seed sales last year. 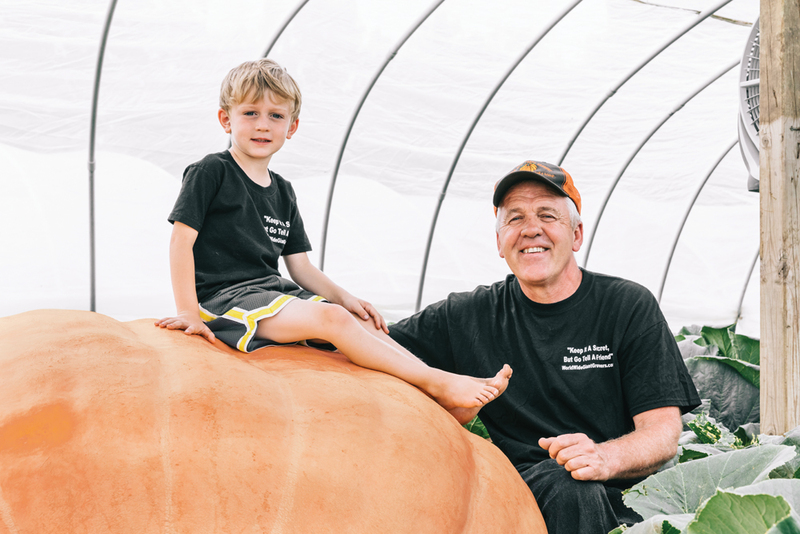 His grandson, Jackson Clementz, sits on a monster pumpkin. Now he’s got a fence — and a wall of sunflowers — to make sure the pumpkin patch doesn’t become a roadside attraction. 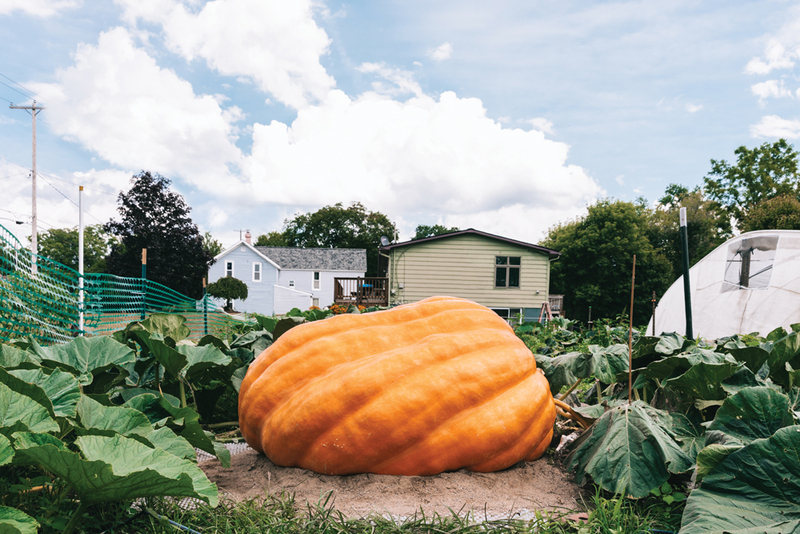 In the world of Michigan’s giant pumpkin-growers, Clementz is the one everybody’s chasing. His 2014, 1,947-pound beaut set the Michigan record, and no one — including him — has been able to beat it since. (Some California champs have weighed in at well over 2,000 pounds). But it took a while for Clementz, 55, to get to the top. Twenty years ago, when he first started growing giants, he usually held down the seventh or eighth spot at pumpkin weigh-offs. Then, his colossal pumpkin named Tiny Schwarzenegger snatched the No. 1 rank in the state, kicking off Clementz’s impressive winning streak. In 2015, Clementz grew a 1,734-pound orange beast that he nicknamed Tiny Gotbackenegger. He took home the gold — and $5,000 — at the competition in Dublin, Ohio (the Buckeyes booed a winner from Michigan, naturally). The same year, he brought a 1,177-pound pumpkin to Indiana and scored another two grand. And although Trumpkin the Pumpkin didn’t take home an official title in 2016, the 1,474-pound behemoth drew thousands of viewers to Clementz’s YouTube account. Clementz’s love for gardening has deep roots. Growing up, he tended to his own plot, and at 10 years old, he became a door-to-door salesman in his neighborhood, selling seed packets from the American Seed Company for just 25 cents a pop. 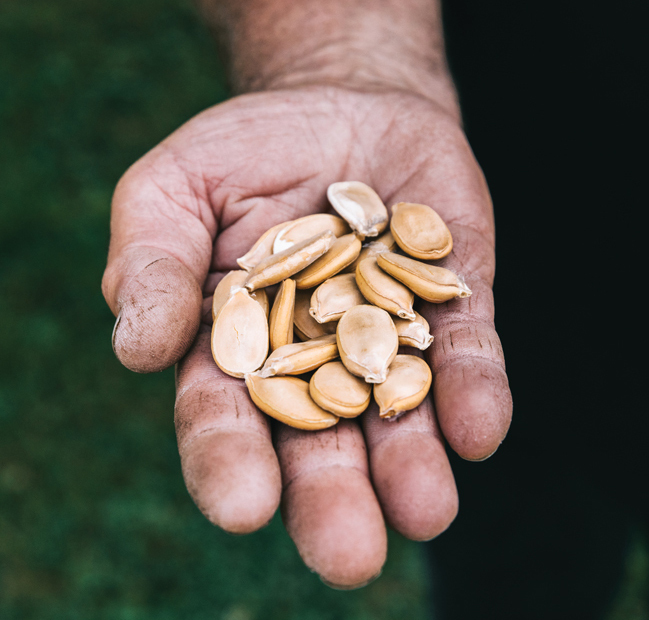 By his 30s, Clementz was planting pumpkin seeds he bought from the grocery store and using tricks picked up from his uncle, who grew pumpkins on a farm in Grand Blanc. Then, in 1996, his uncle showed him a flier that offered $50,000 to the first person who grew a 1,000-pound pumpkin. Clementz jumped on the opportunity, planting a normal seed in his garden. That year, he fell a little short, growing just a 525-pounder, but he was hooked. Each year, the quest to grow the next record-breaker begins seven months before typical 12-pound Jack-o-lanterns start popping up on porches. In early April, Clementz plants a seed indoors, and three weeks later, transplants it into his backyard. To make sure the plant’s giant genetics aren’t diluted with pollen from its lightweight cousins, he hand-pollinates the flowers. And they grow big — fast. This season, at a mere 41 days old, his brightest contender weighed more than 900 pounds. Every day, it packs on roughly 40 pounds, more stretch marks, and a deeper orange tint. Though nothing’s guaranteed, Clementz has a hunch it will be the largest he has grown yet. He’ll find out at the Great Pumpkin Commonwealth weigh-off in Hamilton, Ohio, on Oct. 13, and hopefully have its name picked out by then. The best one lands a spot as the sole occupant of a 1,300-square-foot greenhouse and gets fed 100 gallons of water a day. With too little water, it won’t reach its potential; with too much, it could rot. 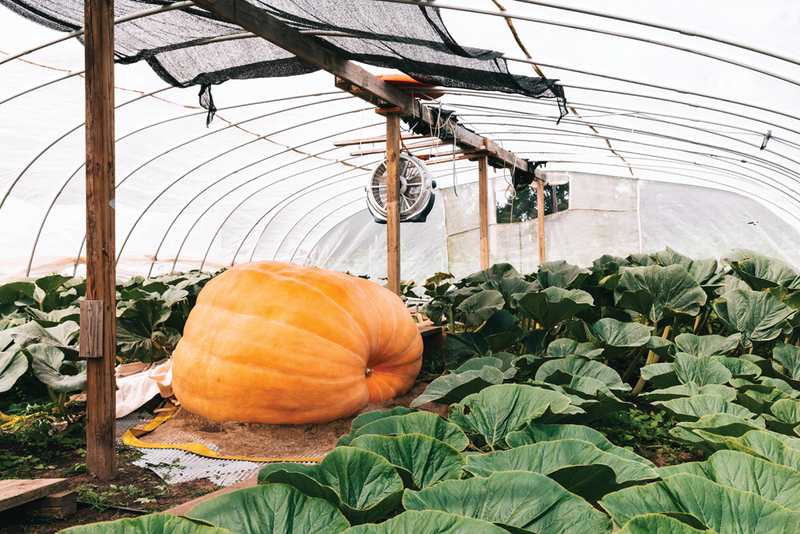 He’s constantly pulling weeds and keeping the pumpkin at its ideal temperature, placing a propane heater in its greenhouse if a cold spell hits. All the while, mother nature is working against Clementz: A pumpkin growing too fast runs the risk of cracking or splitting open. This year’s first-string backup recently took a blow to the skin during a hail storm, leaving a two-inch scar. A three-inch hole will get you disqualified. The night before a weigh-off, Clementz cuts each pumpkin’s vines and hoists it off the ground with an 80-horsepower John Deere tractor. Then, it’s into his friend’s trailer to hit the competition circuit. Contestants can only compete with one pumpkin per weigh-off, and the same pumpkin can’t compete in more than one. 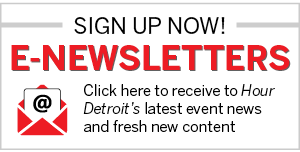 After Clementz has had his time on the winners’ podium, he’ll travel throughout Michigan with the pumpkin in tow, raising money for the Spirit of Alexandria Foundation, which offers scholarships for elementary school students to attend camp at the Howell Nature Center. In 2015, Clementz sold raffle tickets to win the pumpkin or a cash prize of $300 and collected $3,200, with half of the proceeds going directly to the scholarship foundation. The aficionado is also back in the seed business — this time, he’s selling individual seeds from his giant pumpkins. Most retail for $50 a seed, though the seven he has left from his Michigan state record pumpkin aren’t for sale. With an average of 500 seeds in each pumpkin, Clementz brought in more than $10,000 in seed sales alone last year. He also launched his own line of fertilizers that are specifically designed to help others grow giant vegetables. Not everyone is a fan of Clementz’s kooky approach — and the fact that he’s turned his hobby into a business. Many of his critics are rooted in Canfield, Ohio, where they allow stark-white and “ugly” yellow pumpkins to compete, much to Clementz’ disapproval. To him, a pumpkin isn’t a pumpkin unless it’s bright orange. And in 2014, when he catapulted from his usual 8th place spot into second with his 1,947-pound orange stunner, Clementz became a target. The coordinator barred him from selling his products in the building, as well as bringing “Bubba” to the stage. As business booms, Clementz is aiming to retire as a contractor and manage the pumpkin business full-time next year.